Blizzard has posted the rules and regulations for their annual (?) Fan Fiction contest, and it’s a must read if you’re an author; aspiring or otherwise. Here’s a quote of the rules and prizes. Submit a 2,500- to 7,500-word short story written in English and set in the Warcraft, StarCraft, or Diablo universe by August 23, 2010, and earn your chance to visit the Blizzard headquarters and meet the writers and staff behind the lore of Blizzard’s games and books. Grand Prize: The grand prize winner will receive a trip to Blizzard’s headquarters in southern California, where you’ll meet and eat with the Blizzard writing staff. You’ll also receive your choice of a Diablo III OVERTHROWN Barbarian diorama or a Frostmourne sword. Some bolding were done by us for clarity. If you are curious of how Blizzard’s HQ looks, we have a gallery with pics from there you might want to check out. They have upped the game slightly with Prizes from last year, as you now can choose between a Frostmourne Sword or an OVERTHROWN diorama and now get the runner-up books signed by all related people at Blizzard. Blizzard has also re-posted last year’s winners. The grand prize winner in its entirety, and excerpts from the seven honorable mentions. Only one of them is set in the Diablo universe, but you can still check out the entries for inspiration or just reading enjoyment. The contest FAQ strongly suggests you get some editing assistance if you’re not sure of your technical skills, and while stories must be original work, there’s nothing prohibiting you from taking suggestions or making changes based on feedback. Posting your work in our FFF would be an excellent way to accomplish both of those ends. 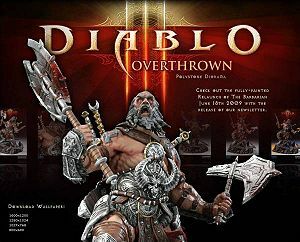 It’s likely any good ones will be featured (after the contest) in our Dark Library column as well as added to the Diablo Wiki Fan fiction archive. You should also check out the official rules, since they get very legalese. Anything you submit becomes Blizzard’s property, whether it wins or not. As someone (okay, me) pointed out last year, this contest is basically a massive open source plot generator for Blizzard. They’re spending very little on prizes, and in return they’re getting thousands of free ideas to advance the plots of their game worlds. On a fan-made-related note: that Diablo Mosaic thing has got more pics in the gallery now. Take part yourself! Just remember: 800x600px.